Sometime last year I crowed about a thrifting haul. I scored multiple thrifted items in the course of one week – something that rarely happens to me. In fact, it hasn’t happened since. But not for lack of trying! One of the items I didn’t tell you about was the $60 thrifted dresser with killer legs. I found this dresser at my local Habitat Restore. It has become my go-to place for inexpensive furniture partly because it’s located only a few miles from my house, but mainly because of the ‘inexpensive’ part. I would have bought the dresser on-the-spot, but I needed to go home and measure. Our master bedroom is located on the second floor of a home built in the 1930s. Due to the ceiling angles, I needed to make sure that this dresser wasn’t too tall for the room. Once I made the ‘all systems go’ determination, I hustled back to the Restore to claim the dresser as my own forever and ever purchase the dresser. There had been some movement on the sales floor in my absence, but I finally spotted what I was pretty sure was THE dresser. There’s often a tag on the furniture at the Restore that says the piece has been decontaminated in some way. I’m not exactly sure what that process entails, but I’d like to think it would include removing old pill bottles from a dresser’s drawers. That’s how I knew this dresser was THE ONE I wanted. The pill bottles were still in the drawer. How reassuring. Now, don’t worry. The pill bottles were empty. But still! Who doesn’t throw these things away?!? Especially 35-year-old pill bottles!! Yes, they were from the 1980s. Now most people might just take the dresser home, clean it out and move on with their lives. Handy Husband and I aren’t most people. We googled the medications and the dosages on the pill bottles. Turns out, this gentleman from Pennsylvania was on not one, but two anti-psychotic medications in a dosage that is no longer recommended as safe by any medical authority. That was our first clue that this piece of furniture probably had some stories to tell. If furniture could talk. 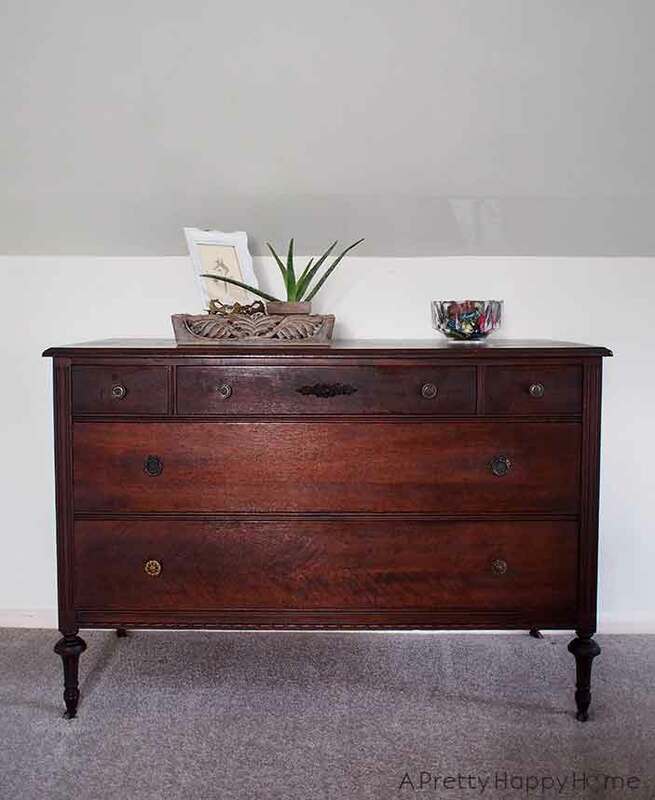 Our second clue about the interesting life of this dresser was found on the address card tucked in one of the dresser drawers. It was for a gentleman – not the one who had the prescription – who worked for the United States government in an area that dealt with national security. Yes, we found that out via an internet search too. How reassuring. It was a relief to find the third and last thing in the dresser, a vintage movie ticket stub. It looked like what we would now call a raffle ticket, but was printed with the name of a cinema in Pennsylvania. At least someone was having fun! The dresser was in pretty good shape. All I did was clean it and apply Howard Restor-A-Finish in the dark walnut color. The Restor-A-Finish is like magic! It seems to ‘erase’ scratches and can work miracles in bringing a piece of furniture’s finish back to life. When that was dry I applied Howard Feed-N-Wax to condition and polish the wood. It doesn’t leave the furniture feeling greasy or waxy and it smells nice too. At some point I should probably strip or sand down the dresser top and re-stain it. Partly because there were a few marks the Restor-A-Finish didn’t fix. 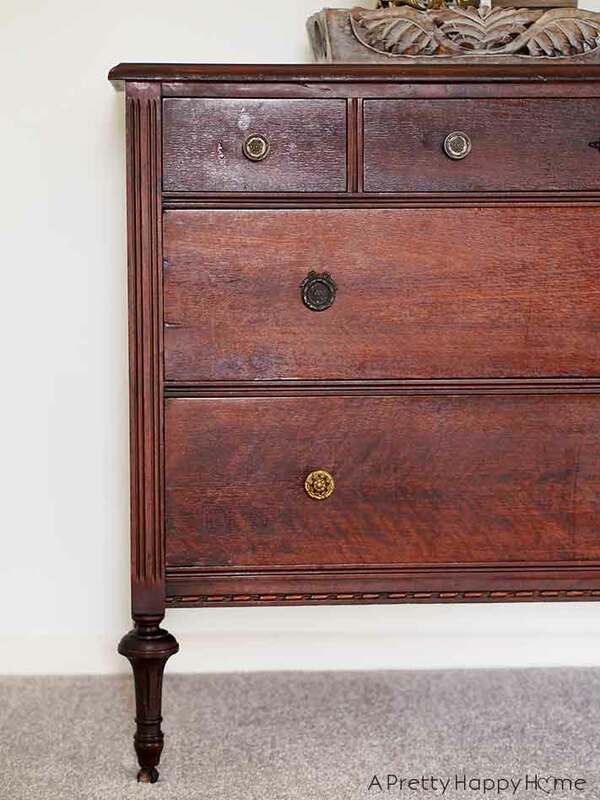 Partly because the dresser had a mirror attached originally and the holes where the mirror was attached should be patched. Honestly, none of those imperfections bother me right now. The hardest challenge will probably be to find two replacement drawer pulls. The bottom drawer has different and newer hardware than the rest of the dresser, so I would like to remedy that. I just haven’t taken the time to do an internet search for new pulls. I had other search priorities! 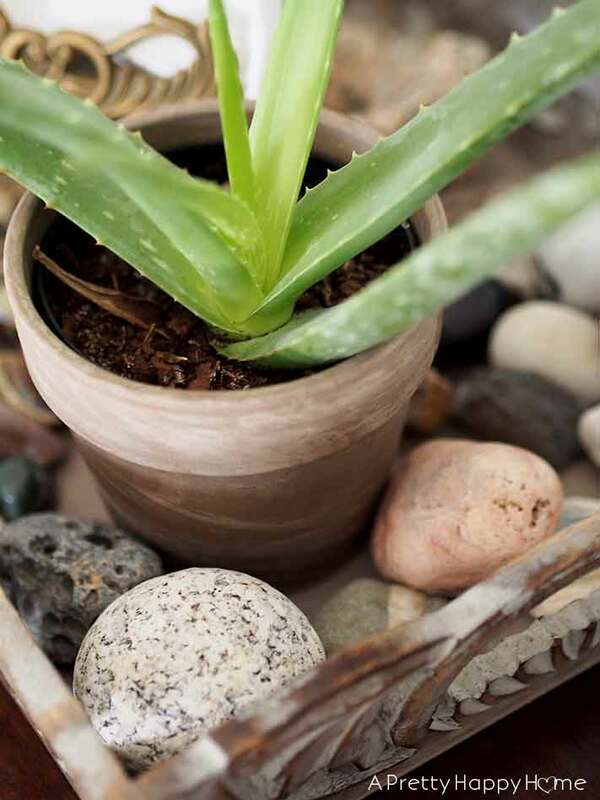 On top of the dresser I have a wood tray that holds an aloe vera plant. The aloe vera plant made an appearance in my post about the painting I found in the trash. The tray also holds my collection of memory rocks. When we travel or have a memorable day as a family, I try to find a rock to commemorate the experience. I write the date and location on the rock with a Sharpie. Last, but not least, I have to mention this thrifted drawing I bought for a dollar. It is sitting on a gold picture easel that was my mother’s. 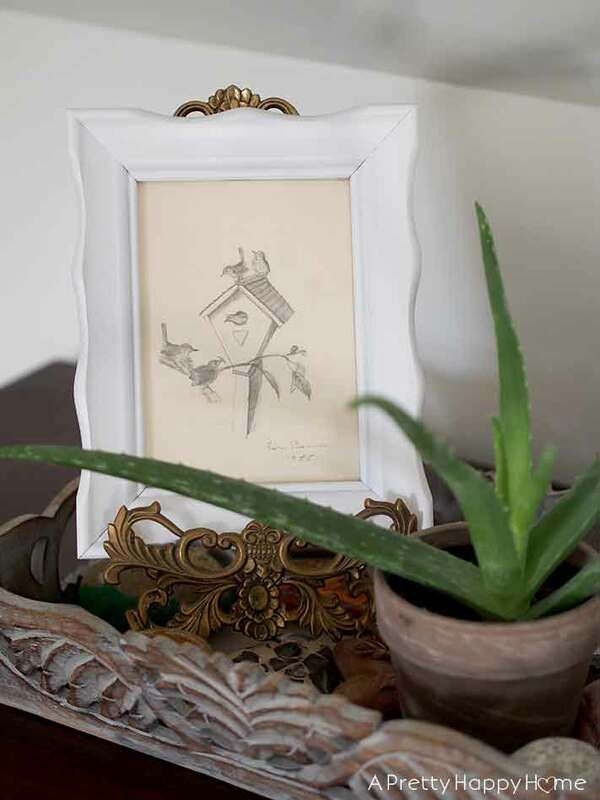 I originally bought the drawing just for the frame, but when I looked closely at the drawing it was too sweet to not use in my home. The sketch is signed by a Fern Barnes and dated 1955. In 1955, Disneyland opened. Gasoline cost 23 cents per gallon. Rosa Parks was arrested. Steve Jobs and Bill Gates were born. The polio vaccine was deemed safe. I don’t know how old Fern Barnes was in 1955 or what happened to her, but I hope someway, somehow she knows that her drawing brings me joy every time I look at it. Have you ever thrifted furniture? 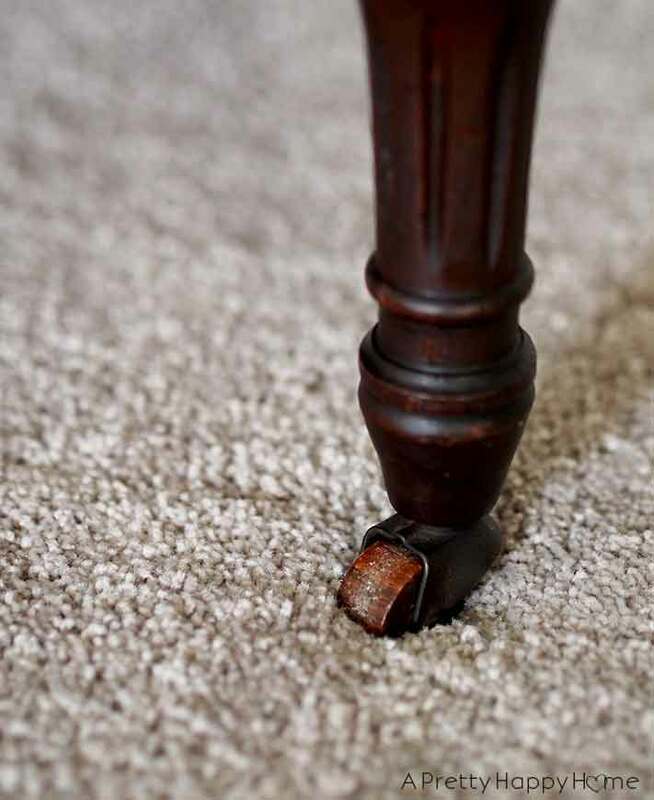 Do you also wish that furniture could tell you where it’s been and what history it has seen? If those pieces could talk!! I’d love to know more about the pieces I collect, but mainly, I’m happy to be giving them a new life. I just wish that one of these days I would find cash instead of garbage tucked away in a dresser drawer. I wiped both of these products on with an old rag. *Affiliate product links used in this post. I get credit when you use my links to make purchases and it doesn’t cost you anything extra. Thanks for clicking! If you’ve read this far, you get a million bonus points! Here are some other posts you might enjoy, which are even better than bonus points. The dresser is beautiful. You have a good eye for finding nice usable things. I have the bedroom set that belonged to Randys parents. They bought it in 1945. Randy refinished it. It is a treasure as far as I’m concerned. Oh, I’m sure it is definitely a treasure! Definitely keep that set and pass it down!